This page of a chronicle from the time of King Cnut (1035) to 1286 begins with the coronation of Edward I in 1274. It tells of the Statute of Westminster between Parliament and the King (1275) which defined the legal privileges of landholders, and continues to tell of the death of Pope Gregory X and election of Innocent V, who also died in the same year (1276). 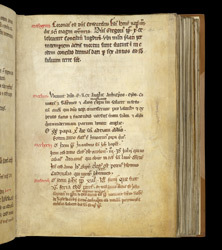 The entry in a different hand at the bottom of the page tells of the installation of Robert Kilwardby as archbishop of Canterbury in 1273 and the rapid succession of popes after Innocent V: Adrian V (1276), John XXI (1276-1277) and Nicholas III (1277).